give a fig | What a salad it was! What a salad it was! Two of my dear friends came a-callin’ on Saturday night. It was a joy to pull together a meal for these soul sisters – and one that elicited a chorus of mmmms as we chowed down with abandon. Enough of the chatter. Let’s talk food! 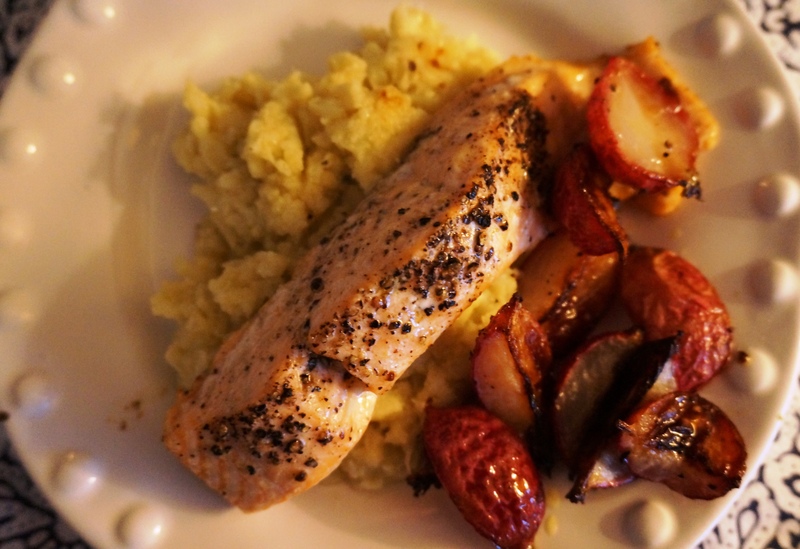 The main course was simple enough: hunks of roasted salmon splayed across mounds of cauliflower mash, with roasted organic radishes on the side. Simple, but rather heavenly. If you haven’t tried roasting radishes yet, you need to add this adventure to your list. The radishes lose their punchy spice and become buttery and mellow when roasted. The cauliflower mash is simple to prepare: steam a whole head of cauliflower florets until tender. 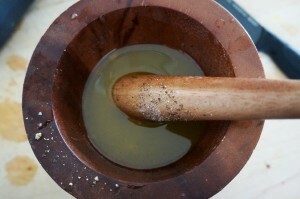 Toss into a big bowl, add 1/4 cup of melted ghee (or extra virgin olive oil), sea salt and pepper. I added a few tablespoons of nutritional yeast for good measure. Use a potato masher to bring to ‘mashed potato’ consistency – or blend up in a food processor. Add fresh garlic if desired. But…the piece de resistance was the outstanding salad. One of my favourite food bloggers, Eleanor Ozich of Petite Kitchen, posted this recipe, which she calls A Summer Salad for Entertaining. Check here for the recipe. What a unique combination of ingredients: arugula, thinly-shaved fennel (I used a hand-held, inexpensive mandolin), fresh mint leaves, toasted organic walnuts, and plenty of crumbled, creamy goat cheese (Eleanor uses shaved parmesan, but I rather like the creaminess imparted by the goat cheese). 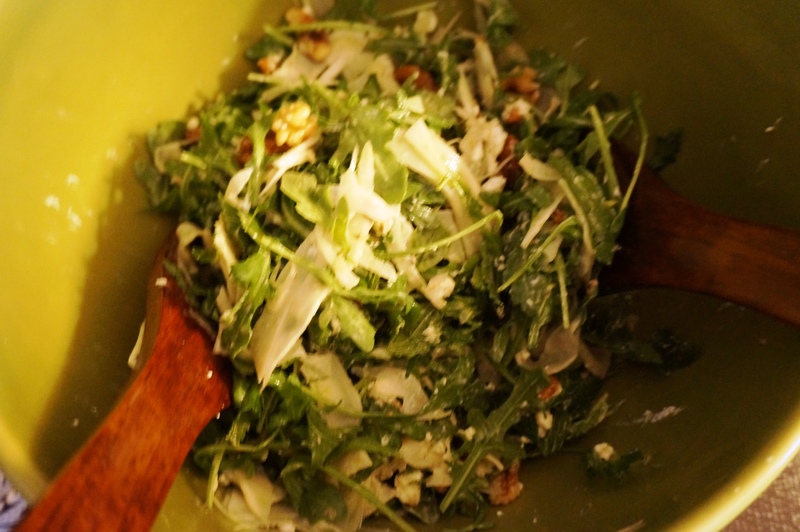 And…the dressing. The dressing. Now, don’t recoil in horror. Those of you with an ounce of ‘chef-iness’ in you will understand that anchovies impart an umami deliciousness to food. Umami is defined as a savory taste, and was discovered as an adjunct to the list of the first 4 human tastes – sweet, salty, bitter, sour – about 100 years ago. Most of us, when asked, would answer with a resounding no! when asked if we like anchovies. However, when prepared as as a flavour enhancer/addition and not a stand-alone fillet, anchovies can elevate a dish to a level that Makes. Your. Pants. Fly. Off. And no, you would never guess their presence in this dressing. I mortared and pestled a few anchovy fillets with fresh garlic, olive oil, fresh lemon juice, sea salt and pepper. Essentially, the anchovies break down and melt into the lushiousness – the whole thing emulsifies into a creamy dreamboat of a sauce.